Don't ask if I speak Dutch, I apologize, I only know a few words, the strict necessary to research my favorite art and designs. I love looking for “Delfts blauw”, “stilleven met bloemen”, and I would be very happy to remember the name of the beautiful precut illustrated sheets of decoupage that are specific to the Netherlands (please shoutout here if you know it). Do try these expressions in Pinterest or Google image for lovely suprises! Now, to celebrate the famous Delft Blue earthenware, I made this little house ornament. I took a model I made 2 years ago that I like very much, and painted the decor in watercolor with cobalt blue like the real thing. I also had fun and painted the edges like old earthenware, but digitally. I't's fun to jump from a technique to another...as much as speaking several languages. Click on the picture to download a printable pdf, cutout, fold, glue, insert a LED tea light. I like the ones that lights by itself everyday at a set time, it’s magical. It’s cute enough for a hostess gift. I should make one to use as a chocolate box, thinking about it. Maybe if I opened it by the roof? 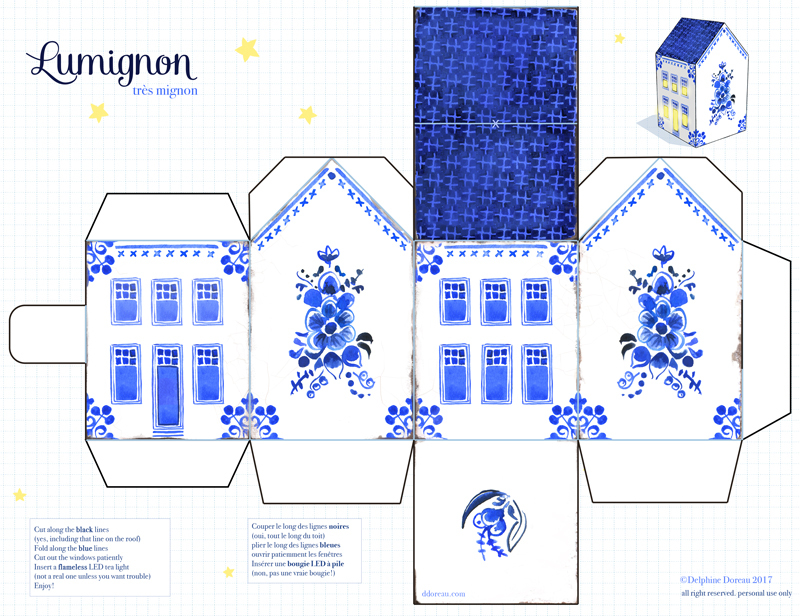 Pour celles qui ont eu la gentillesse de répondre à ma question sur instagram (@del4yo), voici comme vous l'avez demandé, une petite maison en bleu de Delft. J'ai peint assez de fleurs pour une deuxième maison, j'essaierais de faire cela demain. J'ai noté, maintenant que cela fait longtemps que je les fais, que les maisons faites en papier bien épais survivent plusieurs années, tant qu'on ne s'assied pas dessus...cliquez sur l’image pour télécharger un pdf imprimable.